In 1987, botanist John Burley collected samples of the rare Calophyllum lanigerum var austrocoriaceum from a rainforest in Borneo. Back in the lab, the tree samples showed promising activity against HIV-1, including strains of the virus that were resistant to antiretroviral drugs. Researchers returned to the area to gather additional material for research, only to find the trees had been felled. Shortly thereafter, Borneo banned the felling and export of Calophyllum and an in-depth global search for additional trees began. Fortunately, the British had collected specimens nearly a century earlier and had placed them in the Singapore Botanic Garden. Today, research continues into Calophyllum’s active compounds and the trees have exhibited anti-cancer, anti-parasitic, anti-bacterial and anti-viral properties. One of the more promising discoveries has been the isolation of (+)-calanolide A, an alkaloid which has been identified as an active agent against both HIV-1 and Mycobacterium tuberculosis. The alkaloid is currently in development as a novel therapeutic agent against HIV-1 infection. In this instance researchers were fortunate to have found the trees preserved in a botanical garden, but 46,000 to 58,000 square miles of forest are lost each year (the equivalent of 48 football fields every minute). As the forests fall, we are losing some 135 plant, animal and insect species every day—or some 50,000 species a year. To read more about the impact of deforestation and how you can help visit https://www.worldwildlife.org/threats/deforestation. More formally known as the Zizphus mauritana, elements of the jujube have been a part of traditional Chinese medicine for 2,500 years. The tree appears in Classic of Poetry, a collection of Chinese poetry dating from the 11th to 7th centuries B.C., and John Gerarde mentions the jujube as an excellent tonic for all parts of the body in his Generall History of Plantes published in 1597. Every part of the jujube is used medicinally. The roots treat coughs, gout and rheumatism; the leaves have exhibited substantial hypoglycemic effect; the bark is used to treat dysentery and has been shown to kill tumors; the fruit is suggested as an immune stimulant as well as a treatment for cuts, ulcers, pulmonary ailments and fevers; the seeds are known to quell nausea, vomiting, and abdominal pain during pregnancy; and the flowers serve as an eye ointment. With 64 alkaloids, the jujube offers a range of potentially useful medicinal substances, and research into the plant continues. Recently, the alkaloid betulinic acid, which is widely distributed in the plant, has demonstrated the ability to kill human melanoma cells while leaving healthy cells alive. In addition, betulinic acid has also demonstrated antiretroviral, antimalarial and anti-inflammatory properties. In 1962, Arthur Barclay collected a sample of the Pacific Yew from the Gifford Pinchot National Forest in Washington State as part of a screening program funded by the U.S. National Cancer Institute. It was the first step in what would be one of the most important and influential cancer drugs ever discovered. Because only small quantities exist in the bark, the isolation of the Yew’s alkaloids presented a challenge. In 1966, researchers Monroe Wall and Mansukh C. Want finally isolated the active compound, taxol, but further work on elucidating the alkaloid’s structure was put on hold as the scientists worked on their other exciting lead, camptothecin (see the post on camptothecin here). Because of taxol’s shortcomings as a drug candidate, the response to its discovery was underwhelming. This is because it required a lot of plant material for a low yield, it was difficult to formulate, it worked by an unknown mechanism of action, and its only known activity was against leukemia, for which other drugs existed. It wasn’t until the alkaloid showed extremely promising results against ovarian and breast cancers – coupled with Susan Horowitz’s discover that the alkaloid promoted the assembly of tubular into microtubules – that interest in taxol increased. Taxol’s promise soon ran into ecological concerns and political protests, however, as demand for the Pacific Yew skyrocketed. It was estimated that in order to keep pace with the projected need, 360,000 trees would have to be killed each year. It was clear that an alternative supply route was desperately needed, and researchers raced to find a solution. Finally, in 1991, a semisynthetic process was developed that utilized the needles of the much more common English Yew. Recently, a plant tissue culture method was discovered that eliminates the need for hazardous chemicals, and it requires less energy to produce. Today, taxol based drugs are some of the best cancer treatments available. Taxol is included on the World Health Organziation’s list of essential medicines – a list of the necessary and most important medications needed to support a basic health care system. It is used to treat breast cancer, ovarian cancer, non-small cell lung cancer, pancreatic cancer, and AIDS related Kaposi sarcoma. In 1966, researchers Monroe Wall and Mansukh Wani isolated the alkaloid Camptothecin from the bark and stem of the Camptotheca Acuminata tree (also known as happy tree, cancer tree or tree of life). Native to China, the tree has been used for centuries in Traditional Chinese Medicine as a natural remedy for liver ailments, psoriasis, stomach problems and gallbladder disease. Although Wall and Wani were searching for precursors to cortisone and other steroid hormones, their studies instead revealed the tree’s remarkable anticancer activity. Early development of Camptothecin as an anticancer drug soon ran into obstacles, however, as the alkaloid wasn’t water soluble, and it demonstrated unpredictable toxicity. After a failed clinical trial in 1971, it looked as if the discovery was a dead end. Interest in the plant’s potential was revived, however, in 1985 when it was revealed that Camptothecin killed tumor cells by a novel mechanism, primarily by poisoning the nuclear DNA topoisomerase I enzyme, which disrupts the reproduction and duplication of cancerous cells. Today, Camptothecins are among the most important anticancer alkaloids of the 21st century. Currently, several Camptothecin analogues (including Topotecan and Irinotecan) have been approved by the FDA and are used against diverse cancer types including small cell lung carcinoma, colon and rectal cancer, cancer of the central nervous system, renal cell carcinoma, ovarian and breast cancer, lymphoma and several different leukemias. The text in the background and the palette used in this painting derive from one of the most important ancient texts in Chinese medicine, the Yellow Emperor’s Inner Classic, or Huangdi Neijin. Dating to the second century BCE, the book covers the theoretical foundation of Chinese Medicine and marks a radical departure from the old shamanistic belief that disease was caused by demonic influences. The Huangdi Neijing advanced the Taoist theories of yin/yang and the role that the five elements play in physiology and pathology. The text postulates that disease occurs when the body loses its harmonious relationship with the environment and advises how to live in balance with the five seasons (each represented by a color: red, blue or black, yellow, green and white). I’ve been crazy busy in the studio getting ready for my show, which opened on Monday at the University of Portland, but I thought it might be time to take a quick break and share a painting with you. The winter snowdrop has a long history in Eastern Europe and Russia as a treatment for disorders of the central nervous system. In fact, its roots as a medicine may stretch back to the 8th century BC and the poet Homer. In Homer’s story The Odyssey, the god Hermes gives Odysseus an herb called Moly (which some speculate is a winter snowdrop) to protect him from the witch Circe. In the story, Circe drugs Odysseus’s crew “to make them wholly forget their native land.” With help from Hermes and this magical herb, Odysseus is able to resist Circe’s spells and subsequently persuade her to restore his crew. In the 1950s, research started into the snowdrop’s medicinal qualities as a treatment for Alzheimer’s disease—or our modern “forgetfulness.” According to one story, a Bulgarian pharmacologist noticed people rubbing snowdrops on their foreheads to ease headaches, which sparked his interest. In 1952, Soviet pharmacologists isolated the alkaloid galanthalamine and scientifically demonstrated its drug potential. Today, galanthamine is an effective treatment in mild to moderate cases of Alzheimer’s disease, muscular dystrophy, and as an augmentative therapy for autism. In 2010, the CDC released statistics that show Alzheimer’s is the sixth-leading cause of death. 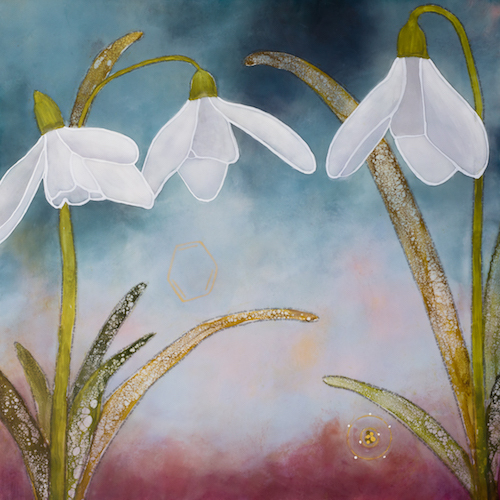 That same year, a team of researchers at the University of Barcelona discovered three new alkaloids in the winter snowdrop that had not previously been identified in nature. Researchers continue to explore these and other bioactive compounds found in the winter snowdrop to further understand how they might be developed into effective medicines. Visit http://www.chm.bris.ac.uk/m…/galanthamine/galanthamineh.html to read more about galanthalamine, its history, and how the alkaloid helps patients with Alzheimer’s by inhibiting the enzyme acetylcholinesterase from breaking down acetylcholine in the brain.